Hawaiian Airlines, announced its system-wide traffic statistics for the month of February 2018, yesterday and they appear to be on the up. Hawaiian welcomed more than 900 thousand guests in February 2018, a record for the month of February and an increase of 8.6 percent over the same period last year. Total traffic (revenue passenger miles) increased 7.4 percent on an increase of 4.9 percent in capacity (available seat miles). Load factor increased 1.9 points to 84.8 percent. The table below summarizes traffic statistics for February and year-to-date compared to the respective prior-year periods. Hawaiian has led all U.S. carriers in on-time performance for each of the past 14 years (2004-2017) as reported by the U.S. Department of Transportation. Consumer surveys by Condé Nast Traveler and Travel + Leisure have placed Hawaiian among the top of all domestic airlines serving Hawai'i. Now in its 89th year of continuous service, Hawaiian is Hawai'i's biggest and longest-serving airline. 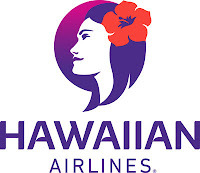 Hawaiian offers non-stop service to Hawai'i from more U.S. gateway cities (11) than any other airline, along with service from Japan, South Korea, China, Australia, New Zealand, American Samoa and Tahiti. Hawaiian also provides approximately 170 jet flights daily between the Hawaiian Islands, with a total of more than 250 daily flights system-wide. Also on the up, though not released publicaly are passenger complanints, which have seen an increase of 1.7% over the same period last year.